A wealthy big game hunter and his group become trapped in prehistoric times where they are stalked by a ferocious dinosaur. The NOAA, EH26 satellite confirms infrared Geothermal Energy readings experiencing an immense volcanic eruption in the oceans under Bermuda. Professor William Taheri and his crew prepare to discover the truth of Atlantis. Charles Aitken: Seven cities to Atlantis? You know, the Greeks always claimed there were nine. Atmir: Plato was not always right. Charles Aitken: You know about our history? Atmir: Far more than you realize. I don't know what people have against this movie. Okay, so some of the special effects aren't great, but to be honest I prefer films like this which have interesting plots, solid characters and imaginative scenery to the kind of effects-dependent trash Hollywood is currently churning out without care or interest. The story involves scientists intending to explore under the ocean with the use of a diving-bell. 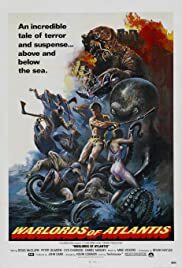 However, after they find a gold statue they, together with most of the crew of their ship, are abducted by a giant octopus and taken to the lost undersea world of Atlantis. This is a classic and highly entertaining film with good performances from the cast and atmospheric settings with appropriately haunting music.